The United States is pressing Britain to raise defence spending and become a great contributor to the common security of the NATO alliance, but attempts by British defence minister Gavin Williamson are being frustrated by Chancellor Philip Hammond who is delaying any decision on extra cash, reports The Times. The revelation of the pressure from America for Britain to pull more weight within NATO comes just a month before a major NATO summit in which President Trump is expected to challenge all alliance member leaders over their failures, and as Britain prepares to leave the European Union and either relaunch itself onto the world stage, or relinquish its questionable status as a first-rate power. Presently, Britain’s defence spending languishes at two per cent of GDP — the bare-bones minimum required of NATO members — a comparatively modest contribution which appears to be imperilling Britain’s relationship with the United States as the ally of choice. While Britain does officially hit the NATO baseline of two per cent, critics have pointed out Britain’s Ministry of Defence only sustains this level through creative accounting, including war pension costs in the total defence spending over the line. The highly respected International Institute for Strategic Studies (IISS) in London published figures in 2018 that found for the second year running, without the pension spend Britain’s military budget was actually just 1.98 per cent of GDP. The British government disputes the figure. 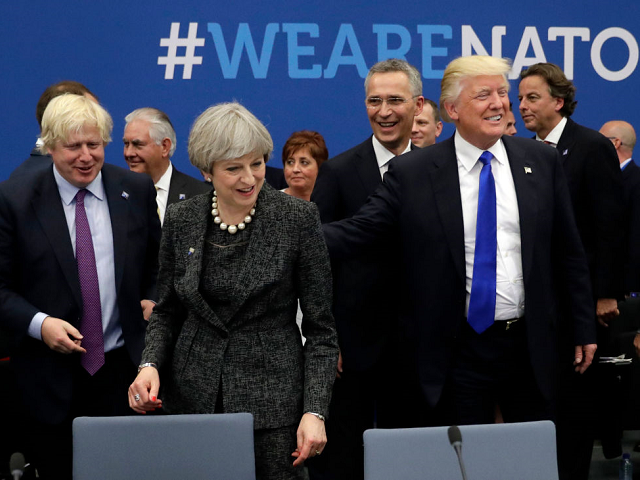 Despite the question over the figure, Britain is still one of the largest contributors to NATO after the United States, an alliance where almost all members fail to meet their basic treaty requirements and have done so for years. The Times reports that the need for more funding for the military is being hampered by forthcoming budget increases in the NHS, Britain’s nationalised healthcare system which continues to cost the UK taxpayer more annually than any other single expense. Yet the report in Britain’s establishment paper of choices ignores the near-£14 billion ringfenced international aid budget, despite significant public support to cut it and see the money spent elsewhere. The latest pressure on Britain to do more comes just days after President Trump took to Twitter to make his feelings on the failings of the alliance known. In another key indication of the importance to the Presidency of rebalancing the NATO alliance and giving a greater share of responsibility to member states other than the United States, U.S. Ambassador to the German Republic Richard Grenell spoke out on NATO this month, telling Breitbart London that European member states were not ready to defend themselves.